427 pages | 302 B/W Illus. 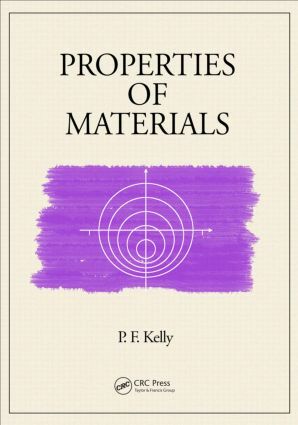 The second volume in the author’s three-part series, Properties of Materials uses the principles of classical mechanics to qualitatively and quantitatively model specific features of matter. The text develops linear models of elasticity to correlate and quantify the changes in an object’s shape induced by the application of a constant force. It describes quiescent and flowing liquids and gases and examines the behavior of oscillating systems subjected to time-dependent external applied forces. The author employs linear superposition to analyze the combined effects of two or more waves simultaneously present in a medium, such as standing waves, beating, interference, and diffraction. The book considers acoustics, including the production, propagation, and perception of sound, as well as optics, including the laws of reflection and refraction. It also treats temperature, heat, and thermometry before applying the laws of thermodynamics to ideal gas systems. Throughout the investigations of particular phenomena, the author emphasizes the modeling of composite systems assembled from simple constituents. This text extends the rigorous calculus-based introduction to classical physics begun in his Elements of Mechanics. With more than 300 problems, it can serve as a primary textbook in an introductory physics course, as a student supplement, or as an exam review for graduate or professional studies. View the author’s related textbooks Elements of Mechanics and Electricity and Magnetism. Read reviews of Elements of Mechanics. P.F. Kelly is an associate professor of physics at Ave Maria University in Florida. He previously held a faculty position at North Dakota State University and he undertook post-doctoral studies at the Center for Theoretical Physics, Massachusetts Institute of Technology, and at the Winnipeg Institute for Theoretical Physics, University of Winnipeg. He holds a Ph.D from the University of Toronto. His areas of interest include theoretical, particle, gravitational, mathematical, and computational physics.